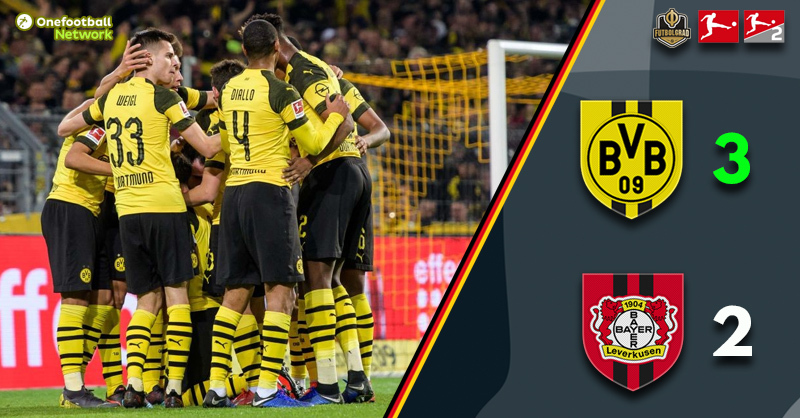 Dortmund vs Leverkusen – The hosts emerged victorious in a pulsating 3-2 win against Bayer Leverkusen at the SIGNAL-IDUNA PARK. Dan-Axel Zagadou put Dortmund ahead before Kevin Volland equalised for Peter Bosz’s side. 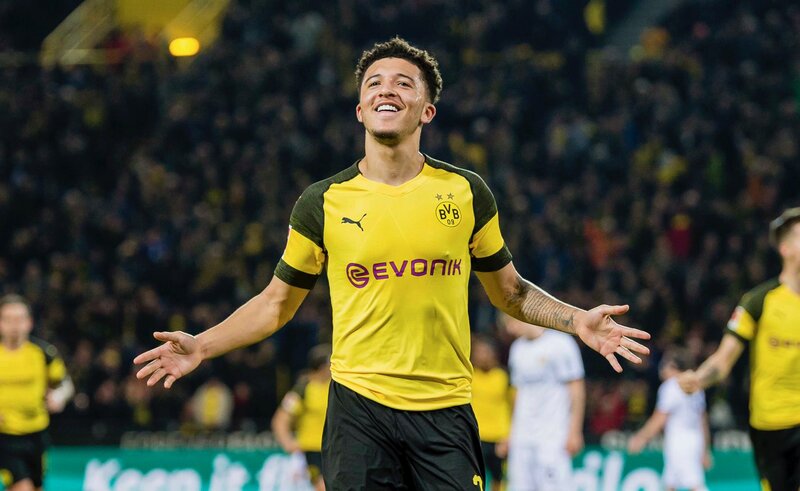 Jadon Sancho then restored Die Schwarzgelben’s lead with a sublime volley sixty seconds later. Bayer Leverkusen started on the front foot with Dortmund’s passing wayward and the hosts unable to string three passes together. Leverkusen were winning the midfield battle with an organised press forcing Favre’s side into errors. Dortmund had just 23% possession in the opening 15 minutes as a Sven Bender effort was deflected for a corner and Kai Havertz shot narrowly wide. The Black and Yellows got a foothold in the match midway through the first-half with Jadon Sancho looking the most likely to make it happen. Abdou Diallo was finding space, sending a cross to Sancho who picked out Alcacer – who could only steer his shot over the crossbar. Dortmund’s dominance was short lived however, a beautiful exchange between Havertz and Kevin Volland resulting in the Leverkusen striker firing past Roman Bürki to make it 1-1. A minute later Dortmund restored their lead. Another cross from Diallo sailed over Tin Jedvaj straight to Sancho who unleashed an unstoppable volley into the bottom corner. What technique, what a strike! The game opened up in the second half with both sides creating counter-attacking opportunities. It was Dortmund that struck first with Achraf Hakimi’s cross falling to Mario Götze who finished past Hradecky to make it 3-1. Paco Alcacer thought he had finished off a fine team move to give Dortmund an unassailable 4-1 lead but the goal was ruled offside. Leon Bailey had a diving header saved before Lucas Alario replaced Bailey and immediately got involved, his header forcing a strong save from Bürki. Raphael Guerreiro conceded a free kick after holding back Havertz from which Leverkusen got back into the game. Julian Brandt’s free-kick found Jonathan Tah who powered his header past Bürki to reduce the deficit to 3-2. Memories of the 3-3 capitulation against Hoffenheim came flooding back with Leverkusen going for broke. Dortmund were able to hold on this time however, a vital victory after going five games without a win in all competitions. The teenager was the catalyst for Dortmund overcoming their slow start and getting the hosts into the game. His pinpoint corner found Zagadou for the opening goal before showing an incredible technique to volley home for this ninth goal of the season. Dortmund restored their three-point lead at the top of the Bundesliga but Bayern München won’t be relinquishing their title without a fight. The Black and Yellows were far from convincing and Der Klassiker at the Allianz Arena on 6 April is shaping up as the title decider.